How much brighter is the full Moon than the quarter Moon? If we consider the ratio of the illuminated area, "Double" seems to be a reasonable answer. But in reality, the full Moon is more than four times bighter than the quarter Moon. Why? The "phase angle" is defined as the angle between the lines connecting tne Sun-Target and the Target-Observer. Namely, the phase angle for the quarter Moon is 90 degree, and that for the full Moon is almost 0 degree. It is well known that airless bodies in our Solar System, such as the Moon, generally show a brightness enhancement when the phase angle approaches zero. This phenenomenon is called the "opposition surge". Do we observe the "opposition surge" on Itokawa? You can find the answer in the images below. The phase angle was abour 35 degrees for the left image and less than 1 degree for the right image. 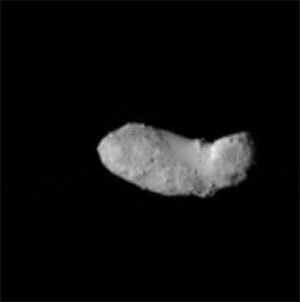 The Hayabusa camera team confirmed the "oposition surge" through careful inspection of these images. More detailed analysis provides important information on the surface state, such as the difference between bare rocks and sands. The observation of the "opposition surge" was not a serendipity, but one result of an elaborate operation. 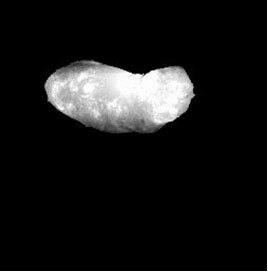 Hayabusa had to come to the Sun-Itokawa line at the distance of 3 hundred million kilometers from the Earth. The position tolerance was approximately the size of Itokawa, namely a few hundred meters. The Hayabusa navigation team accomplished the feat by skillful guiding.